Most of these had print runs that some big publishers would kill for today. So a few of you had some suggestions re: good comics from the black and white boom, including several that I own and of course couldn’t dredge up from my memory to include in the initial post. …a serious science fiction adventure/mystery from the creator of Megaton Man , that, as kiwijohn noted, never got to complete its story. Now, it’s been a long time since I’ve read this…I still have ’em, in what remains of my personal comic collection, so when I have a moment I need to poke through them again. As I recall, the art was gorgeous in this series. …probably remembered by a good chunk of the population as Cadillacs & Dinosaurs , a somewhat more commercial name for marketing purposes. Written and drawn by Mark Schultz, and boy, what drawing! 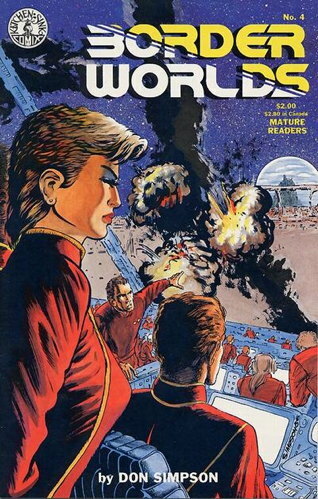 The word “lush” was pretty much invented to describe Schultz’s art. 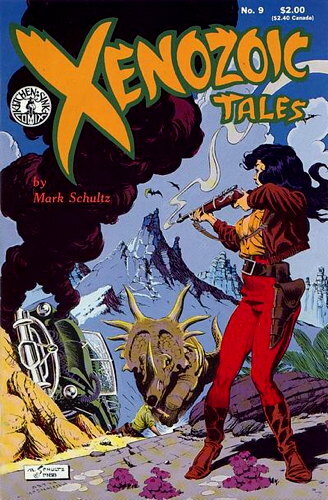 There were a number of spin-off comics under the C&D title published by Topps Comics in the ’90s by other creators…can’t say how good those were, but the original Xenozoic Tales is the stuff. …and Iestyn is correct, I should have mentioned it, as it’s a hoot. It’s a parody of manly-man adventure novels/movies/etc. 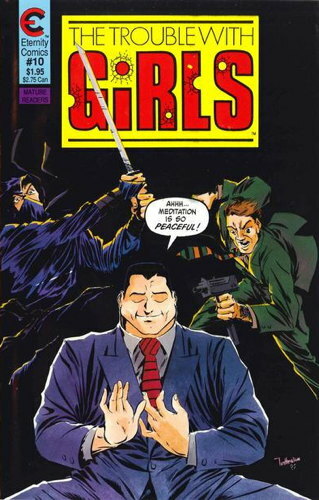 (by Will Jacobs, Gerard Jones and Tim Hamilton) in which our hero, Lester Girls, just wants a quiet evening in with a relaxing book but is constantly beset by spies, ninjas, terrorists, beautiful but deadly ladies, and all your other typical baddies that you’d find in your typical James Bonds or your Executioners or your Destroyers and so on. All very hilarious. Most of it was published by Malibu/Eternity, but it was briefly in color at Comico Comics, and there was a color mini-series at Marvel during one of its short revivals of the Epic Comics imprint. A side note: I think because of our proximity to the publisher, at my previous place of employment it seemed like copies of the first Trouble with Girls paperback collection were always showing up in collections. And not always just a single copy…I think I remember a dozen or more turning up at once in the same assortment. Go figure. …a series that I actually did try to collect. You’d figure, only being seven issues long, it wouldn’t be that hard, but I am still missing a couple. The comic is primarily by Mike Bannon, who was one of the cast of regular characters in the old Cerebus letter columns and is probably the main reason I sought this comic out. Granted, it’s been a while since I’ve read the issues I do have, but I recall being amused by it and I’m sure someday I’ll get around to completing the set. …also noted by MrJM in the comments, and which I’ve also discussed many times in the past on this site. It did come out during the black and white boom, but I always forget that since the comic is just so unlike anything else on the stands. It’s hard to picture it as part of a “movement” (or “phase,” or “fad”) when it’s totally its own weird thing. …and Van Horn, some of you may best know as one of the primary American creators of new Disney Duck comics in the ’80s and ’90s, along with Don Rosa. As an avid reader of the Duck comics during that period, I was very familiar with Van Horn’s work there…but I already knew his name from his children’s books, which I’d encountered during my librarian days. 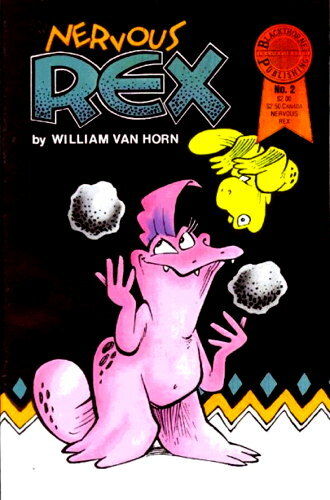 Nervous Rex was one of those comics I’d always meant to look into, as the old job had most, if not all, of them, but just never got around to it, sadly. They always looked like they were delightful. Anyway, there are a few others mentioned in the comments and I’m going to see if I can add any more personal favorites to the list in my next post. And if you have any more suggestions, you know where to leave ’em! so you could easily finish your collection!! Weird that 2 people picked them, I thought they were VERY obscure!! And yes – these comics sold a lot INTO shops, I do wonder how many sold out to customers though!!! Also – YES to Wordsmith – that’s actually one series I would love to see re-shot fro the original art and treated to good printing!!! 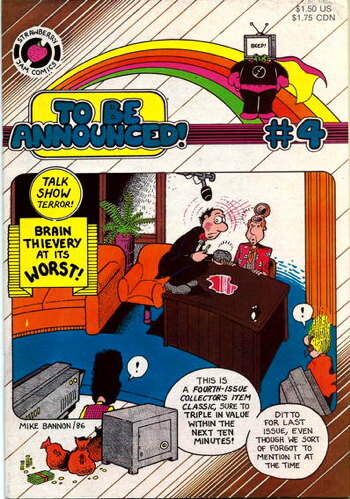 Checker Books put out two volumes of The Trouble With Girls as well – got a good chunk of the original B&W series in those volumes as I recall. I tend to see those around here, as Hastings Entertainment appears to have purchased most of Checker’s backstock when they went out of business – so lots of copies of their TPBs, including the Crossgen, Winsor McCay, Flash Gordon, etc. These two posts certainly stir up some great memories! 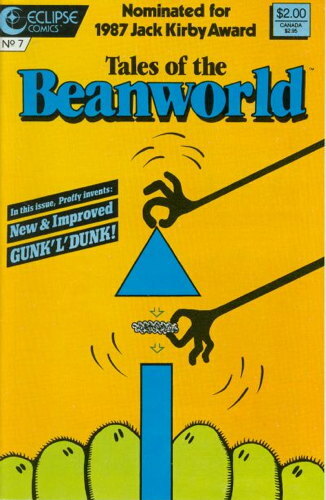 I’m reading Beanworld to my two sons now (8 and 5 years old) and they’re totally into it. Don Simpson has a Border Worlds blog among the assorted blogs he maintains, and he mentions a collection coming next year from Dover Publications. This conversation puts me in mind of the Mister X comic by Dean Motter, Los Bros Hernandez, and others. Not sure if or how it fits, but I still have a bunch of them. That was a weird and stylish book. Bought a collection of Beanworld in the 90s that had a postcard stuck in it. There was a fax number on it. No name or anything. One of my few regrets in life is that I never faxed anything to it. Randal: I was wondering the same thing. When I looked up what had been published, it turns out that Marder finished the “Spring” cycle of stories he wanted to tell. I assume that means there are “Summer” and “Fall” and “Winter” stories, too, but they haven’t been published. Which brings me to my next question for anyone who read the Beanworld stories that came our recently: Did they end in a satisfactory way, or was it more of a “to be continued…” kind of thing?